Just two beutifuly equipped apartments for total 8 persons in the center of Trpanj. Do you want to promote your hotel, pension or holiday rentals? Do you want reliable travel partner in south Croatia? This is the travel guide to Peljesac peninsula, second largest in Croatia (358 km2), located in south Dalmatia in Dubrovnik region. Natural beauty on Peljesac still stands against commercial and urban values. That's why we say that Peljesac is the place where the nature - is still the nature. We wish you splendid holiday in Croatia. Our mission is, not only to present the best of what Peljesac offers to it's visitors, but also to maintain manners of well known southern hospitality - even online. So, if you don't find information about Peljesac you are interested in - feel free to contact us and ask as for help. Currently, we are describing the most attractive Peljesac holiday destinations - Orebic and Trpanj, but - keep visiting us regularly, these pages are always updated with new content, and we will also include other holiday destinations on Peljesac. Peljesac.info gives you possibility to make reservation of accommodation on Peljesac. 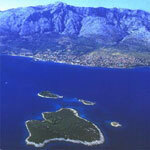 Apartments, camping from Orebic, Trpanj, Viganj and other Peljesac sites. Currently, we are offering you selected apartments on Peljesac by our friends. Not found what you're looking for ?! Our main desire is that this site is informative to it's visitors. As you probably come here in search for information of Peljesac or Croatia, please let us know if you didn't find desired information here. Of course, we can't cover it all, but we would like to adapt our site to it's visitors - therefore making it better media for our advertisers. Please - provide us feedback - just fill type of content you would like to see here in the form bellow. If you include your e-mail address, we will see if we can answer your question, and respond to you as soon as we can. Aparthotel, camping, diving center - on the seafront in Mokalo. Enjoy all qualities of urban living, still in splendid and peaceful environment, close to the sea and the main beach.